The following is a brief recap of the Tues., April 18, 2017, BPS101 Regular Board Meeting. View the agenda and all supporting documents from this meeting and minutes from previous meetings. View BATV’s recordings of previous meetings. Batavia High junior Isabel Walker and senior Kylie Tevonian were both celebrated by their teachers, BHS Art Teacher Dawn Zalkus and BHS English Teacher Amy Biancheri, for earning the highest Gold Medal honor in the Scholastic Art & Writing Awards. 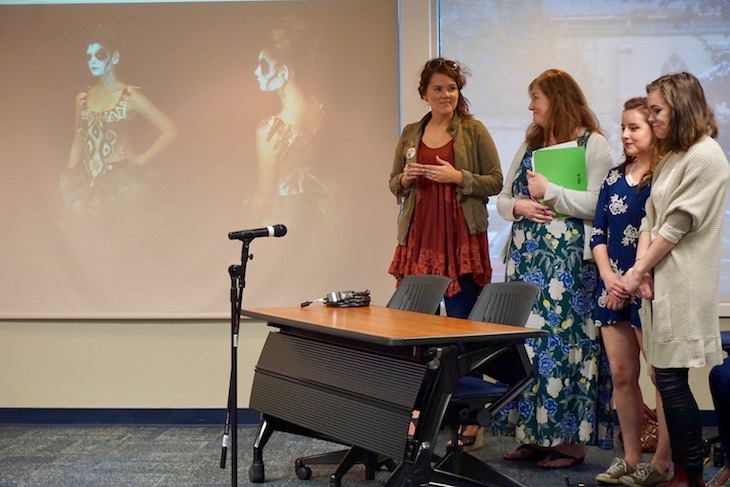 Isabel earned gold for her 2016 Rock the Runway wearable art titled, “ghost,” and Kylie earned gold for her essay/memoir, “Nine Lives.” Alumni of the Scholastic Awards have gone on to become leaders in their fields, including Andy Warhol, Truman Capote, Richard Avedon, Philip Pearlstein, and Sylvia Plath. More recently, Stephen King, Richard Linklater, Zac Posen, and Lena Dunham received Scholastic Art & Writing Awards as teens. Both Isabel and Kylie have been invited to the Scholastic Art & Writing Awards national ceremony, which will be held at Carnegie Hall in New York City on June 8, 2017. East Side Elementary Educator: Rhonda Gamlin, PE teacher at J.B. Nelson School. West Side Elementary Educator, co-recipients: Karen Nellis, Early Childhood teacher; and Kari McQuillan, 4th grade teacher, both at Alice Gustafson School. 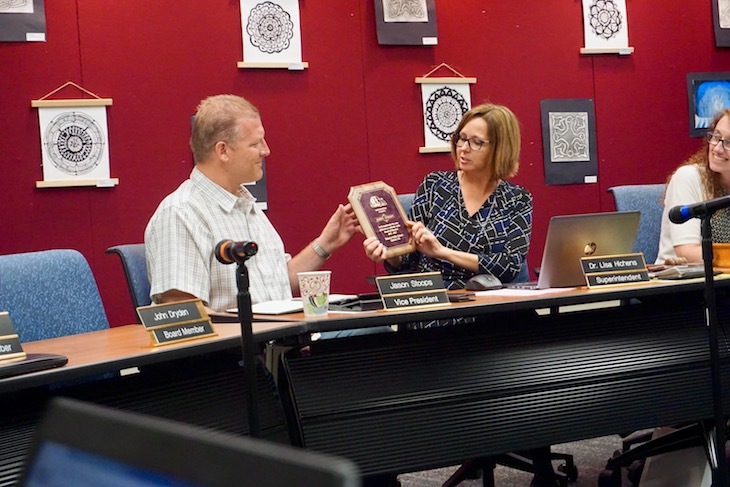 BPS101 Superintendent Dr. Lisa Hichens presented outgoing Board Member/Vice President Jason Stoops with a plaque to celebrate his four years of dedicated service on the Board of Education. 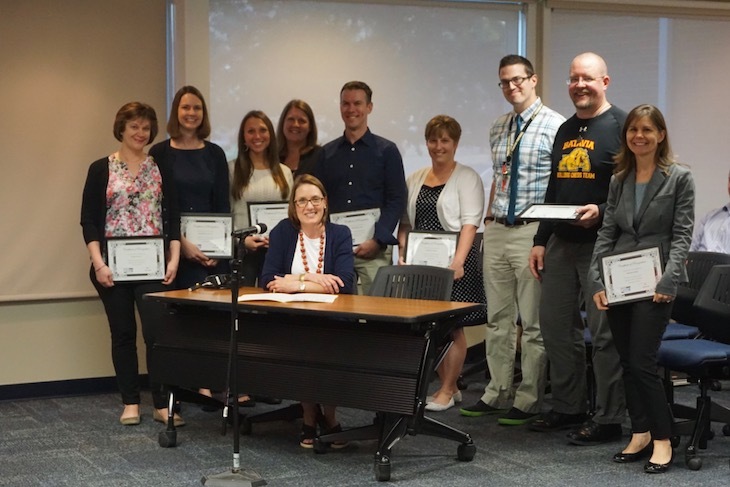 Mr. Stoops’ trademark sign-off at Board Meetings, “Go Bulldogs,” has been officially retired … and will be missed! The FY18 Capital Projects Plan allocated $1M for lighting efficiency upgrades to replace outdated fixtures and save on electrical and operational costs. While the BPS101 Capital Projects Committee recommended this project as a priority, it could not reach consensus on whether to let the work through a standard bid process or utilize a performance contract. BPS101 Director of Operations Mark Anderson and Chief Financial Officer Tony Inglese led a Board discussion about the key considerations and comparison of both approaches. At the end of the discussion, the Board agreed on a performance contract to know the full project cost before entering into an agreement, to avoid change orders, and to keep the contractor accountable for the entire project. In a 5-0 vote, the Board approved the medical and dental insurance benefit plans and changes as presented by Chief Financial Officer Tony Inglese on behalf of the District Insurance Committee. Mr. Inglese pointed out that insurance benefits for BPS101 employees have not changed in over a decade. The approved changes should save the District over $600,000 next year and save employees approximately 5.5% on annual premiums. The Board adopted revisions to the following policies and procedures: 4:110 Transportation, 4:110-AP3 Paid Busing, and 4:110-AP4 Pupil Transportation Eligibility. Newly elected board members will be sworn in, officers will be elected, and the 2017-18 Board Meeting schedule will be confirmed (view tentative schedule).